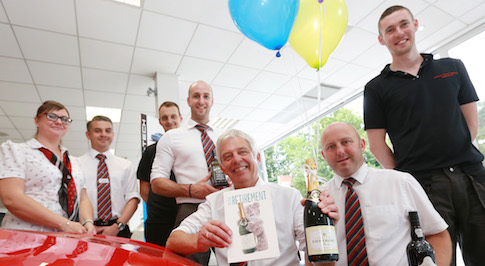 Bristol Street Motors Seat in Barnsley has said an emotional goodbye to one of its most experienced members of staff. Andrew Sykes, 65, from Barnsley has retired after spending more than 30 years working on the site. Andrew has 50 years' experience working in the parts department after joining the motor trade immediately after leaving school. Parts Manager Andrew will be missed by both colleagues and customers who held a party to celebrate his service to the motor industry. Andrew is now looking forward to spending time with his family gardening and following his beloved Manchester United as they prepare for the new Premier League season. Andrew, said: "I am sad to be saying goodbye to all of my colleagues and customers at Bristol Street Motors in Barnsley. Although I am looking forward to spending time with my granddaughters, throughout my 30 years at this site I have made so many good friends and I will miss working alongside them. "Bristol Street Motors Seat Barnsley has a wonderful team and I am going to miss being a part of it." Mark Currie, General Manager at Bristol Street Motors Seat Barnsley, said: "Everybody here at Bristol Street Motors Seat Barnsley is very sad to say goodbye to Andrew, he is a popular member of the team and his knowledge and experience will be sorely missed. "We wish him a long and happy retirement."